I read The Goldfinch this weekend. In between reading, I tried to answer Thomas and Katarina's questions about the book. Unsuccessfully. When I am asked about a book, I want to answer with all the feelings and thoughts and important pieces. How do you take more than 700 pages, and turn it into a two sentence overview? I used this as a defense when Thomas finally turned away from me, hands over ears, saying, "I don't want to hear anymore. I just wanted to know the basic plot. Never mind." He countered by pointing at the television, where The Hobbit: The Desolation of Smaug was playing, and said, "The Desolation of Smaug is a story about 12 dwarves and a hobbit who travel to the Lonely Mountain with the goal of killing the dragon Smaug and taking back the dwarven kingdom." Well played, Thomas. Although I would argue that there is so much more to the story than that, and it suffers from an abbreviated description. The Goldfinch is about teenager Theo Decker, who survives a bombing, and in the aftermath becomes a (mostly) accidental, one-time art thief. That didn't really make you want to read the book, did it? Or maybe it did. I feel like the entire soul of the story was left out in that description. When I read a book, I seize on small moments that were important to me. I have to include them in any description I try to give, because they are integral to what the story meant to me. And then I usually feel the need to provide back story for those moments to the person I'm talking to can see why they were so important. This is the reason I have a hard time condensing an entire book into a short description, or recommending books off the cuff to people who are "looking for something new to read" when I don't know why they enjoy the books they enjoy. Because books are highly personal to me. I know the same thing that makes me love a book, will quite possibly be the thing that makes you want to throw it out of your bedroom window. This isn't to say I don't write book reviews, or suggest books to people, or have discussions about books. I do all those things. But I just don't do it in one to two sentences very often. What did I enjoy about The Goldfinch? The writing. The descriptions (I know I have railed against overly-descriptive books and authors in the past, but I did not feel that annoyance with The Goldfinch). The furniture repairs. But mostly the writing - it is beautiful. I've read a lot of criticisms aimed at Goldfinch author, Donna Tartt, for the length of the book, and suggestions that a heavier hand should have been applied by the editor. I wasn't put off by the length at all. There could have been some cuts, sure, but nothing huge. I guess, like Tartt, I feel sometimes you need a lot of words to reveal the true heart of a story, and I'm willing to read all of them. My biggest complaint would be the weakness of the last ten pages. I would have liked more information about Theo's next steps, but this is not the first book that ended before I was ready to step away from the characters or without the level of resolution I would like. Overall, I really enjoyed The Goldfinch. Have you read The Goldfinch? Do you share my inability to describe entire books in one sentence? If not, please describe your favorite book for me using only 1-2 sentences. "Go read it. Now." <--that is my go-to short book description, too! I love your review. You chose great quotes to showcase the beautiful writing. I have never heard of this book, but I don't really read much :) My hubby may have read this one, though. I love this book! Style, vocabulary, plot, everything! This is definitely a book I'll read again. It really is!! You have to give it a try. I know Lisa liked it, too, because I saw her five star rating/review on Goodreads when I added it to my list yesterday. It is good to know I'm not alone in my long descriptions and reviews. I haven't read it, but then again I don't manage to find the time to do any non-work related reading lately. It can be really hard to sneak in fun reading time. Maybe you would do better to try a shorter book in between work projects. But this one is really good. I don't blame you - I can't describe a good book in one or two sentences either! This looks like a good one! You have made this book sound like something I would love to read! I can not imagine trying to explain the plot of a book in two sentences. I'm like you....who can explain the soul of the book in such a short way? Thanks for this review, which definitely has piqued my interest! My usual description is GO READ IT YOU'LL LOVE IT, But your description caught me, too. 2 sentences is about 20 too few to sum up a great book! Yes I Agree It's Hard To Give A Short Description But This Sounds Like A AWESOME Read I Must Pick Up!! I have not read it but I will put it on my list. I have a hard time with short summaries too! 700 pages is a big commitment- but it sounds like a great book for summer! I haven't read The Goldfinch, but it sounds pretty interesting. I'll have to add it to my reading list! Yes - a one sentence description leaves out so much about The Goldfinch that has to be said to convey the depth and width of the story that unfolds, and the real life importance of it's impact! I couldn't have done it either - obviously, LOL! I have never heard of this book before, sounds very unique read! I havent read the book,but too would find it hard to summarize most stories in just 2 sentences. I LOVED that book! One of the best novels I've read in a long time. She writes so beautifully -- I wish I could work the English language the way she does! I absolutely loved this book and wouldn't try to sum it up in two sentences! Every time anyone asks me about it, I tell them to just go read it! My husband read this and enjoyed it as well. Too funny, well I am loving your description as long or short as it is. This sounds like a good read, this is my first time hearing about it.. but I'm in desperate note of some interesting books! As a literature major, I'm lucky if I can sum up a book I like in a 90-minute class! And I love that artwork in your post. Lovely. I'm the opposite. I probably don't ever say enough about things! I have the book here and haven't red it yet! Now I'm intrigued. 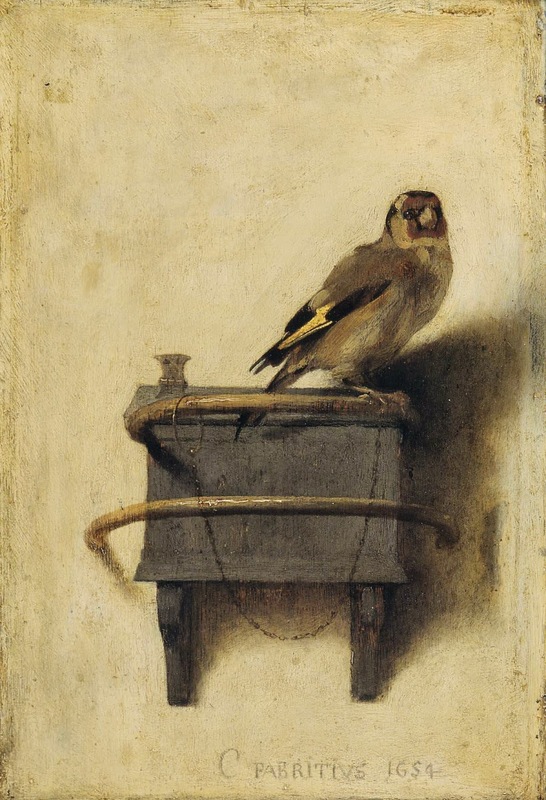 No, I haven't read it but "
The Goldfinch is about teenager Theo Decker, who survives a bombing, and in the aftermath becomes a (mostly) accidental, one-time art thief." didn't make me want to read it either but then again there are lots of stories that have a plot somewhat to this nature and they turn out so fantastic. Cool. I'll recommend this to my little cousin who loves books with teen characters. I've had this book sitting on my bookshelf for a while and haven't gotten to it yet. I may have to move it up the list! I could never review a book in just one sentence either. I have a hard time NOT telling too much...I get excited about books, especially the good ones!